This year, the Museum of Forestry, Hunting and Fishing at Ohrada opens its doors on Good Friday, 30 March. As early as Easter, you will be able to take a look at a new exhibition of historical photographs from the archives of the National Museum of Agriculture depicting fish pond harvests. 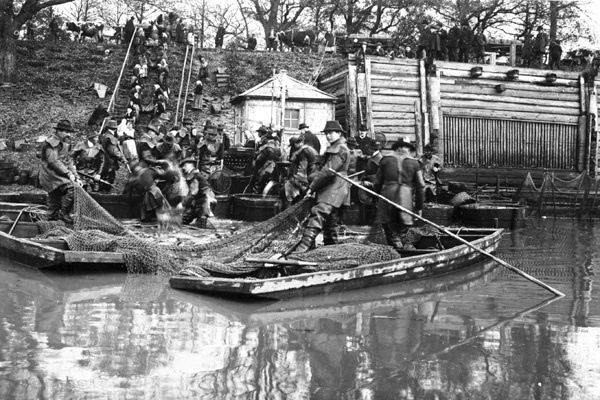 The exhibition presents fish harvests on South-Bohemian ponds from the late 19th century to the present day. You can also compare the changes which this appealing culmination of the work of fish farmers has undergone with time. In the photographs, you can observe, for example, the development of fishing apparel. Some stages of fish harvesting, such as the preparation of ponds and hauling in fish with a trawl net, have remained in their traditional form virtually unchanged, however, other phases, such as the classification, handling and transportation of fish have undergone great changes. The exhibition also offers visitors from other regions of the Czech Republic and from abroad the spectacle of the characteristic scenery of South Bohemia. Over the course of the year, we will change the photographs in order to present you with as much of the photographic archive of the National Museum of Agriculture as possible. You will find the photographs on the ground floor of the hunting lodge in the so-called “fishing corridor”, near to the Fishing exhibition.